It appears that man has always been fascinated with the top. He has the power to spin it and somehow defy gravity by its ability to stand upright on its point, as if magically. It has also become evident that as is true for other items created or invented by man which are found in nature, there is no one point in time where the top can be said to have been invented. It was discovered, or invented, almost simultaneously and most definitely, independently, in many different areas of the world. So, unfortunately, we cannot give definitive credit for the invention of the top to any one person, one culture or even to one geographical area. Definition. Webster�s dictionary defines the top as "a child�s toy shaped somewhat like an inverted cone, with a point at its apex upon which it is spun, usually by unwinding a string." This definition is somewhat limited, as many references throughout history tell of tops also in reference to adults and some of which have no relation to a string. 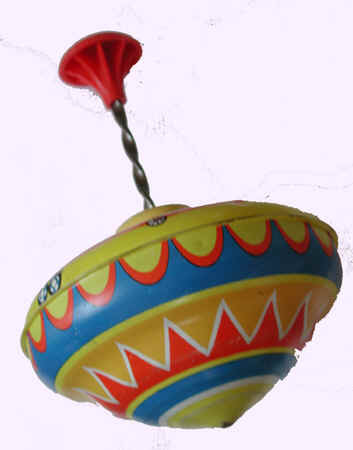 For example, even in primitive Malay, top spinning was an organized adult sport, with tops weighing up to 15 pounds. In Borneo and Java, the handicraft of tops limited them to adult use by their sheer size and weight. Pacific Islanders also had spiritual meanings to the top. In medieval times, there existed a parish top, frequently in the town square, for all to use. In countries such as Japan and China, jugglers and top-spinners are respected adult public entertainers. 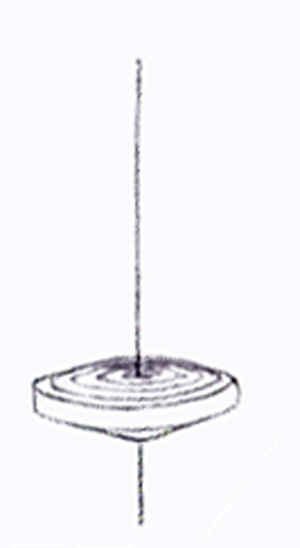 The most common concept of a top is a spinning object supported at one point only. A gyroscope, however, is a top and has an axle supported at two points, while the motion of a bullet from a gun is like that of a top although there is no point of support at all. It appears then, that a better definition would be simply objects that spin on a major axis. The top is most likely to have been invented and re-invented many times by different cultures, completely independent of one another. 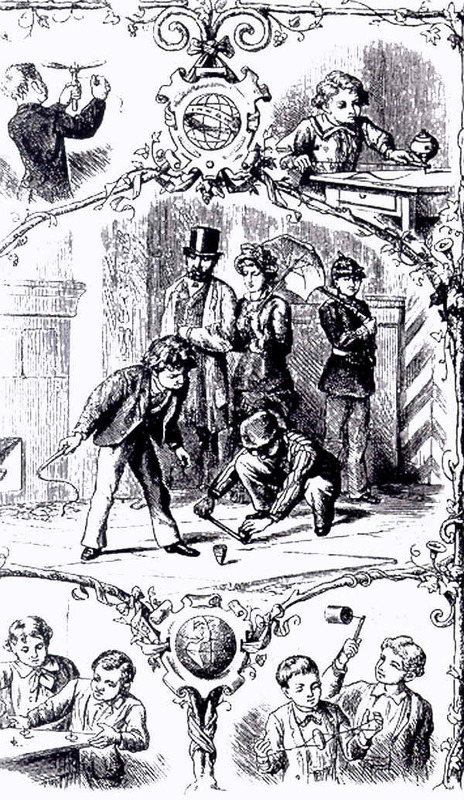 As concluded by D.W. Gould in his book ,The Top-Universal Toy, Enduring Pastime, if it had been easy to disperse information about a simple object such as a top across different continents, there would be evidence of inventions more critical to man�s survival being passed among them as well, but there is not. Tops have been found on all continents except Antarctica. Although its use appears to have been for "play", its introduction was most likely noticed in nature or through survival techniques developed and recognized in many areas of the world. The most natural top is found in the simple acorn. Likewise, maple seeds, with their mesmerizing spin through the air could easily inspire the invention. 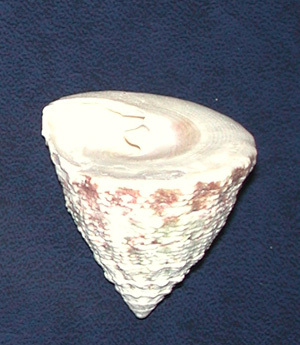 A shell, as shown here, is also a natural found top and most certainly was discovered in areas, which had them available. The Japanese game, named "bai" or "bei" shows a shell used for the top and where the physics of spinning objects was explored by filling a shell with wax or sand in order to increase the top�s weight. Fire-starters, or file drills, found in many primitive cultures, using the rotation of a pointed object to produce fire, could likely have given rise to the spinning top. Another device, a whorl, is defined in Webster today as "a flywheel on a spindle for regulating the speed of a spinning wheel." 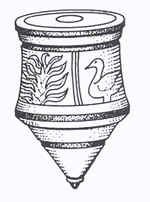 Forms of spindle-whorls were found by archeologists in a number of sites such as Troy (Turkey) and pre-Columbian Peru, and were used to gather and separate fibers. These ancient whorls could have easily been modified by adding a disc to evolve naturally into a twirler top (defined later). Examples of tops made by natives of the Torres Straits (Pacific Islands) supports this development theory. Most primitive twirlers were likely to have been a seed, fruit or nut with a thorn or stick spiked through them. Archeology aids us greatly with added timeline and location information about the top. - In China, whip tops were found dated from 1250 B.C. - Fired clay spun type tops were found from Thebes, Greece dated at 1250 B.C. - Greek pottery, dated around 500 B.C. are decorated with scenes showing top spinners (both whip (figure 10) and twirler (figure 11) varieties) and notably, some of which include women playing with tops. While many would have been made out of wood, it appears that ceramic tops could have been votive, that is, used to honor the gods. (figure 9) Some may have also been a sign of affluence and at times were placed in tombs as an item to be taken into the afterlife. - Roman tops were found made of bone from 27 B.C. Early written mention of the top which first comes from classical literature. adds to the puzzle. 1. The Iliad, by Homer, in XIV 413 in 800 B.C. (Ancient Greece) claims to be a story of the fall of Troy. The classes of tops are differentiated by the way in which they are spun. The order listed does not in any way imply the progression of development of one form to another. 1. Twirler � spun with hands or fingers by twisting the stem. - spun with hands or fingers by twisting the stem. 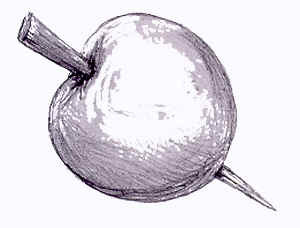 The most primitive form and that which is consistent in many cultures is made from a seed or fruit impaled with a thorn. The most basic form is called a teetotem, defined as �a kind of top spun with the fingers, especially one with four lettered sides used in a game of chance.� Examples are found in many countries, including Japan, Germany, Poland, Korea, France and Scotland. Childhood games played with this type of top were either to simply see how many tops could be spun in motion at one time or to attempt to perform some task before the top�s motion stopped. However, variations of the game were invented when teetotums developed a body in the shape of a cube. On each of the four sides of the cube was a particular letter, signifying a step of the game. For example �T� (for totum) meaning to �take everything�, �A� (for aufer) meaning to take half, �D� (for depone) meaning to put something more in, and �N� (for nihlil) meaning that one neither puts in nor takes out. Forms of this game changed with the nationality that used the toy. The Jewish dreidel displays Hebrew letters and is used in Hannukkah celebrations, but which has no spiritual meaning. 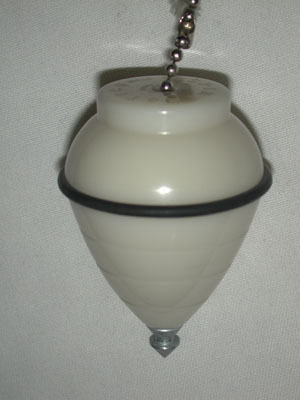 The tippee top (1953 British patent 656540) is a peg with a ball shaped body. To spin the top with the stem down, it spins as expected. However, if you spin the top swiftly on the rounded body with the peg pointing upward, it flips itself over and spins on its peg. A plastic top with these same spinning characteristics was invented by a Swede and named the �Tippy Tap.� The novelty of this action is a puzzlement of geometry and physics to some and mathematics to others. - spun by a cord while the top is held upright with a support. The Twirler progressed by elongating its stem. Motion however, was limited to the amount of spin that could be generated by twisting the fingers. Improvements were made by wrapping a string or rope around the stem, pulling and unwinding it off of the stem, thus causing increased spin. The problem with this method was in holding the top upright while pulling the cord. Handles or brackets were designed to hold the top upright with one hand while being able to pull the cord with the other. The handle was then lifted off of the top once it was spinning. 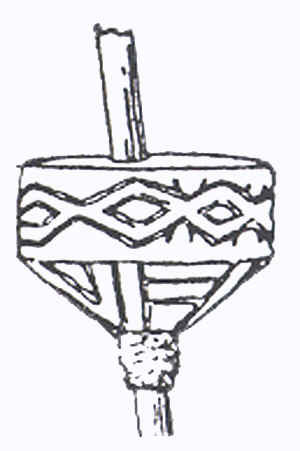 Early cultures used wood or a shell with a hole in it as the handle device. 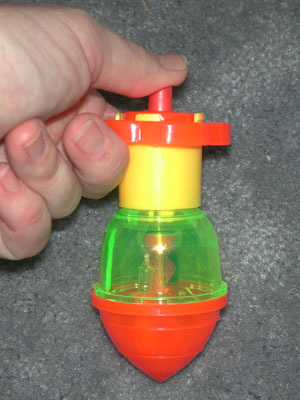 A toy gyroscope uses a similar method, with the frame around the gyroscope being, in effect, the handle or bracket, but which remained fastened surrounding the spinning disk. A variation of this actually ties the cord to the axis of the top. Once pulled, inertial spins the top and rewinds the cord up in the opposite direction upon the stem, allowing repetitive pulls, causing continuous, but reversing rotation. - spun by whipping the top to give continuous motion. 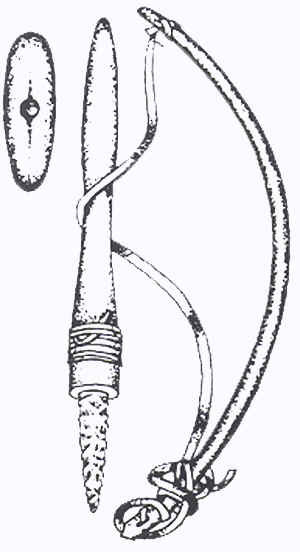 Although as state earlier, forms of whip tops were found in Egypt as early as 2000 B.C. and China from 1250 B.C., formal written record of whip tops are recorded as early as 1344 A.D. (Roman d�Alexandre) and more commonly in the 18th and 19th centuries. 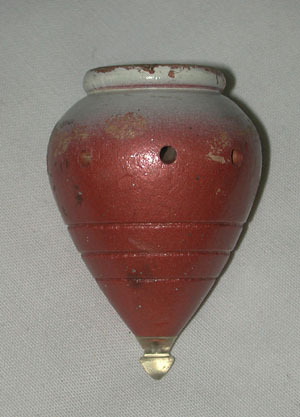 Distribution of the whip top appears to be worldwide, as examples are found in Europe, the Americas, northeast Asia, the Pacific Islands, India and Africa. Many sources give China credit for the invention of the whip top, which was then brought to Europe by seaman who had seen them on their travels and which was noted in 14th century European manuscripts. Though again, it appears that these tops were developed in other places of the world as well, such as Egypt. This concurrent development of different types of tops is proven by studying current day primitive tribes, as the same items are developed without knowledge of their existence in advanced cultures. The whip top has mostly kept to the basic cone shape and was made of wood, fired clay and, in some cases, stone. During the 18th century, heavy whip tops of iron were made with the intent of whipping on the ice of ponds and lakes. The peg of the whip top was not stressed since the point did not have the wear from impact on it as with the peg top. Any imbalance in the top�s construction was also less important, as the constant whipping action seemed to offset its effect on the spin of the top. 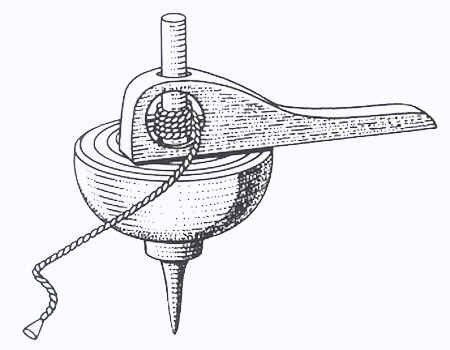 The method of spin was to literally whip the side of the top and continually whip it in order for the top to maintain its spin. The material of the whip itself was probably most important. Europeans preferred eelskin since it was inexpensive, soft and resistant to cracking. America, Asia, and more primitive cultures used different skins or woven cords or fabric. The social significance of the top is most apparent with the whip top. 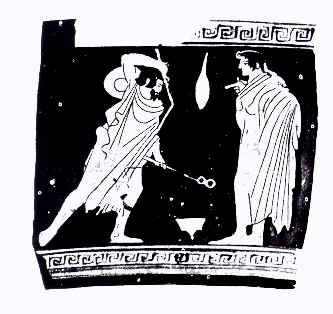 Top spinning was accepted for both sexes in classical Greece (figures 9 & 22), as shown on the pottery carvings and paintings. In the Pacific Island and southeast Asian cultures, it was primarily a male sport, with many fewer girls and seldom seen women participating, while rarely are girls or women playing with tops in European cultures. 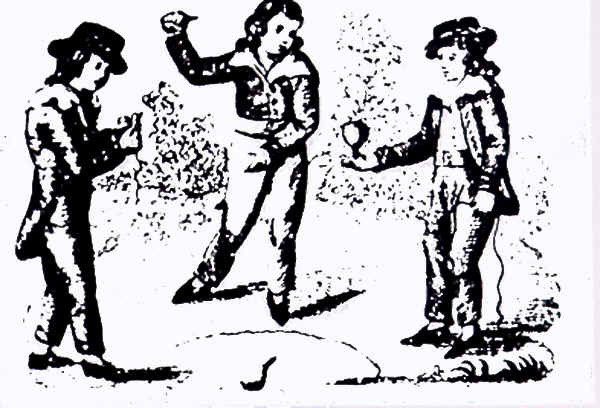 Interestingly, the top was specifically identified as an acceptable form of play when stated on the "Orders, Statutes and Rules" in 1591 of the Harrow School in England, where it stated, "...The scholars shall not be permitted to play, except upon Thursday only sometimes when the weather is fine, and upon Saturday, or half-holidays after prayer. And their play shall be to drive the top, to toss a handball, to run, or to shoot, and none other." (To shoot presumably meant in the form of archery.) The phrase "to drive a top" meant to play with a whip top, which certainly was an inexpensive way of exercise. The parish top (a whip top) has been thought of not only to amuse or provide exercise, but also to keep behavior channeled appropriately or even to be used as a competitive sport between towns. Although it seems that an original parish top failed to survive, drawings found make them appear to have been quite large, possibly 8 inches tall, resulting in an object that was at least 2 pounds in weight. 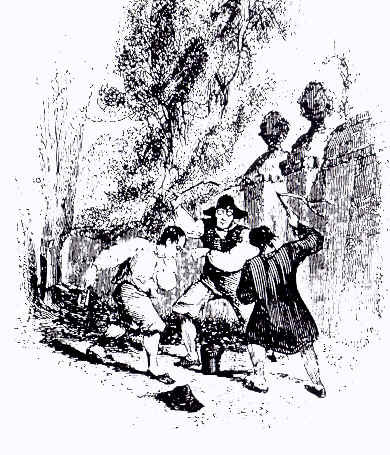 The parish top would be kept in the town courtyard and would certainly require strength and endurance to keep such a large object spinning and at times, with more than one adult whipping. It has also been said to provide a means of keeping warm through the physical effort required. - spun with a cord on the body of the top and thrown, causing spin. 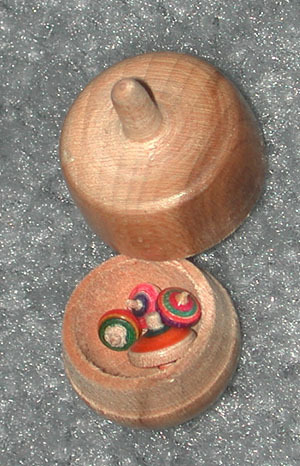 Most commonly called a �peg top", but which name seems inaccurate since original "peg tops" were carved to a point which did not have an actual �peg" inserted into them. 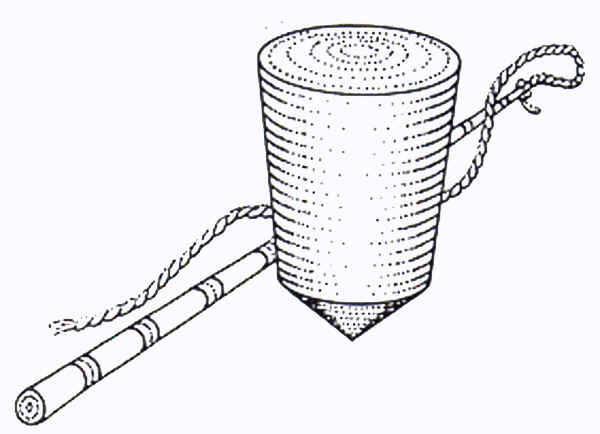 The throwing top, in general, is pear shaped, usually with some sort of point at the narrow end and which is wound by a cord and thrown to unwind the cord from the top, causing the top to spin. Throwing tops do not seem to have existed in classical times, but other primitive cultures did develop them, notably Malaysia and Japan. Providing more forms of play than any other form of top, the throwing top is the only true skill building top, as a player�s skill can be measured and can even be used in competition. 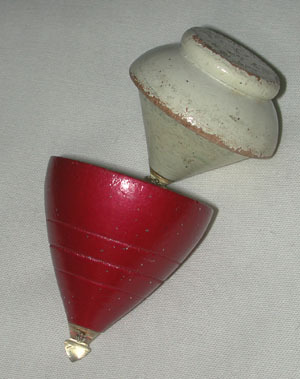 Some believe that the throwing top was born from the whip top, where top spinners could play with a top requiring less strenuous activity than with the whip top. Other sources believe Japan to be credited for the origin of the throwing top, and although no dates or specifics are given to verify this claim, it does seem that Japan or other Northeast Asian cultures should be given credit for tops spun with a string. 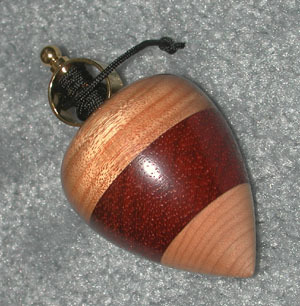 Wood was the most likely material with some tops grooved to allow easier temporary attachment of the cord. The peg itself began as simply a part of the top body itself, carved to a point. Later, harder woods or bones were used and eventually evolved into metals. 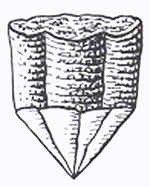 A brad or nail was driven or cemented into a hole in the tip of the top. Balance of the top itself was important as the top spun independently, and an unbalanced top would spin erratically. The peg�s continued to smaller sizes, thus having less contact with the spinning surface, which decreased the friction, and improving the speed and spin time. 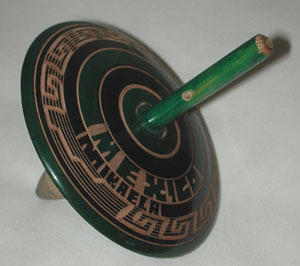 Spinning within a target, removing objects within a target, out spinning other tops and knocking other tops out of a target by a spinning top were common throwing top games. 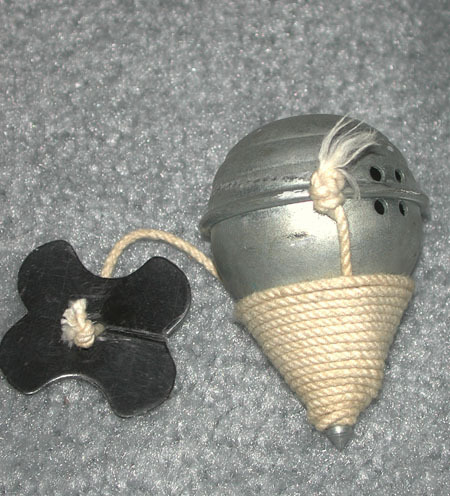 Most remembered in recent history are wooden throwing tops with nail points, which were used in top fighting. Players would attempt to hit their opponent�s top with the intent of splitting it in two. During the 18th and 19th centuries, tops were a favorite pastime of children in Europe and America. Of particular notice are whip tops and peg tops, as shown on these wood block prints from that period of time. Tops were then mostly made of wood, iron and tin. Interestingly, there are several ways of throwing a top with a string. Various methods of winding the string around the top stem from the shape of the top itself. There are also different ways of holding and throwing the top, usually based on preference, but also just depending on how and where one was taught the skill. As a top is thrown, the string unwinds off of the top. As it unwinds, the top will begin to turn over, until the string is completely unwound off of the top. Length and thickness of the string, shape of the top, and the mechanics of procession all have a factor in how the top will turn. Ideally, a top is thrown in such a manner so that the top lands with the point down and standing upright. Figure A. Early throwing tops were made with a rounded top. In these cases, the string was wound with a line of string lying on the side of the top, extending down to the point, then wrapped around the top, over the initial string placement. The �button� at the end of the string is placed behind the hand with the string placed between the two fingers. When the top is released, the string remains locked between the fingers. Figure B. Later, a groove was sometimes made in the top of the top so that a string with a knot at the end could be held in place in the groove, and then extended down to the point, them wrapped upward around the top. Once the top is wound, it can be held and thrown in a variety of ways. Some will hold the top upright, while others prefer to hold with the top on its side when thrown. The most common method in the United States since the 1960�s is holding the top in an upside down position, with the point facing up. Various methods of throw are also used. 1. Underhand throw. Tops can be thrown with an underhand motion, where the top is spun with a sort of flipping of the hand motion. Accuracy can be a problem with this type of throw and does not result in a high speed of spin. 2. Overhand throw. Speed and accuracy are increased as the top is thrown overhand, similar to throwing a ball, but in a downward direction. 3. Side throw (reverse method of typical flying disc motion of throw) The top is held in the hand upside-down, with the point facing up, arm extended. The arm is swung forward while the top is released. Accuracy is significantly increased with this type of throw, so much so that skilled players can hit a bottle cap. 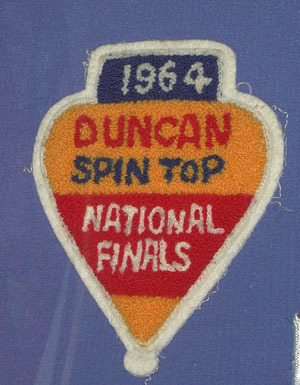 Beginning in the 1960�s, Duncan Toy Company began promotion of spin tops. 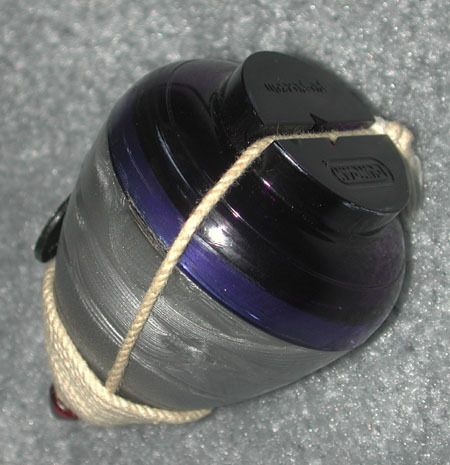 Demonstrators, like those used with the yo-yo, were sent to run promotions in various cities across the United States. Initial tops were made of wood and were turnable-painted in large barrels or machine sprayed. Also during this time, plastics began to be produced by companies such as Duncan, Festival and Royal. Comparable weight plastic tops spun much longer than wooden tops, due to the fact that plastic tops were hollow, distributing the mass to the outside. 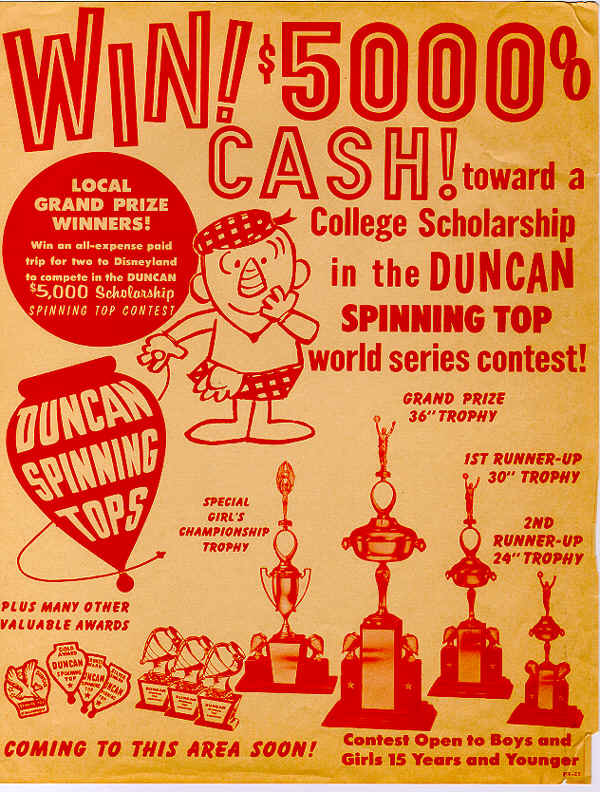 During the years of 1963-1964, Duncan financed regional championships were set in place for the purpose of sending a regional champion to the National Spin Top Competition held at Disneyland in California each year. 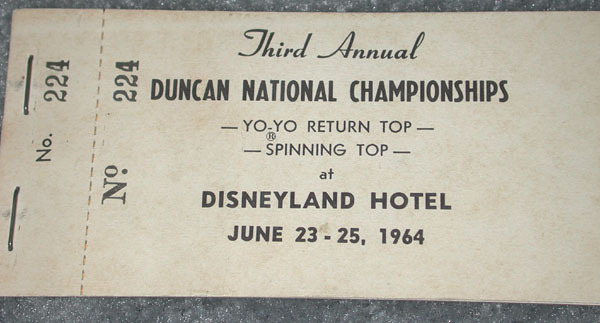 (The National Contest at Disneyland was run for three years, from 1962-1964, but 1962 was run for yo-yos only, while 63 and 64 had both a yo-yo and a spin top championship.) 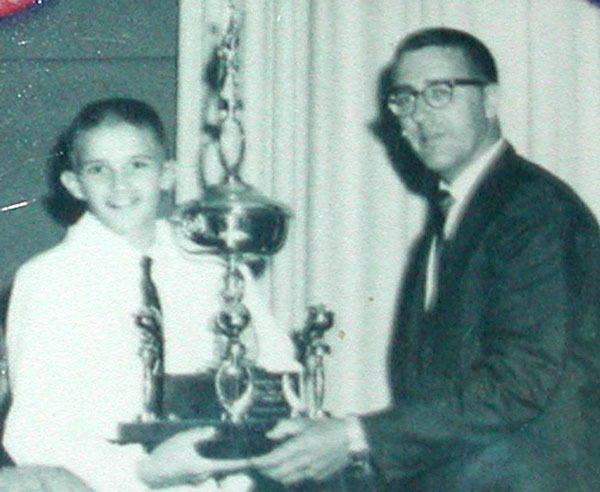 The cash prize was $5000, which in 1964 was huge. Winners were Pete Span (1st), Forest Larson (2nd) and Bob Donna (3rd). In 1965, the Duncan company filed bankruptcy. To the dismay of many determined young top players, the competitions stopped as well, leaving the number of years of National Championships for tops at two. 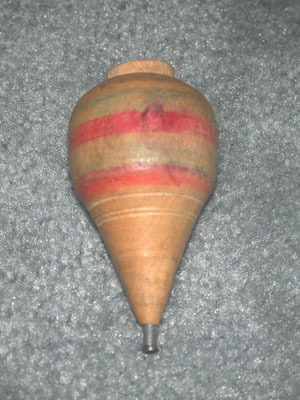 In August of 1991 at the International Jugglers Festival, a workshop was run by Don Olney of The Toycrafter in New York on spinning peg tops. 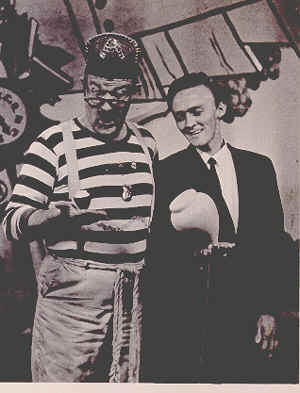 Many embraced this "new" juggling prop and the workshops grew from year to year with the help of some of the "original" 1960�s top players like Dale and Valerie Oliver. Great new tricks were added by more recent top players, and the newcomers swelled the size of the spin top workshops each year. 1991 also marked the first year that Masahiro Mizuno performed Japanese top tricks at the IJA festival. The magnificent Japanese tops and the tricks done with them by Masahiro played no small part in fueling the growing interest in top spinning. 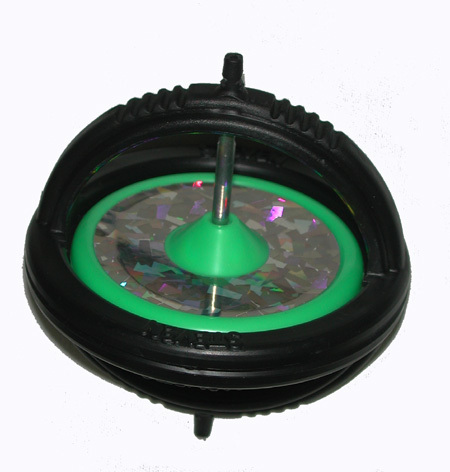 Not until 1999 did the interest in spin tops begin to be fueled once again in the retail market, when companies such as Spintastics Skill Toys, Inc and What�s Next Corporation came out with their spin top lines and began promotion and demonstrations once again. 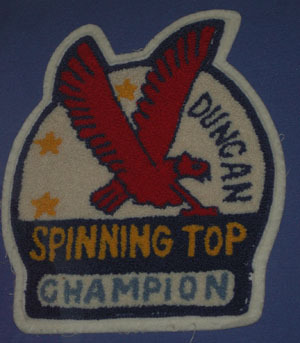 During the 2 years following, Duncan (now owned by Flambeau Products) began selling their line of tops once again and other companies such as Moose of Australia, and YoYo Jam in the United States joined in. 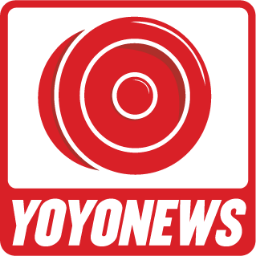 In the year 2000, the first spin top contest since the 60�s was held during the World Yo-Yo Competition in Orlando, Florida, which was followed by a top contest during the National Yo-Yo Competition in Chico, California in October of that same year and repeated by both events in 2001. 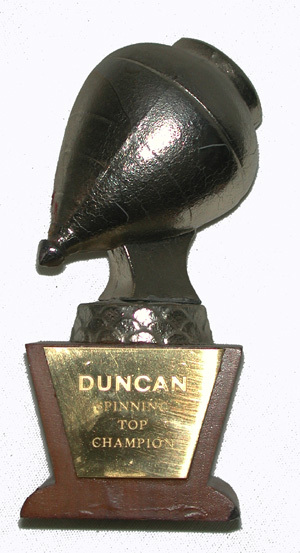 2002 marks the first year that an official National Spin Top Contest will be run since 1964. 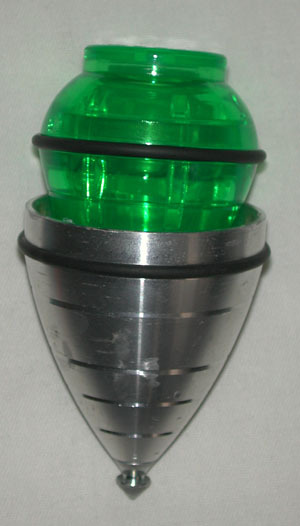 The first commercially manufactured ball-bearing top was designed by Dale Oliver in November of 1995 and was introduced by Spintastics Skill Toys, Inc. in February 1999. Named the Tornado Top, this ball-bearing model allowed for increased spin time by decreasing the friction between the point and the spinning surface. The point of the ball-bearing top does not spin, therefore there is little or no friction between it and the surface. An entirely new series of top tricks are now possible using the ball-bearing technology that fixed tip tops are unable to do. 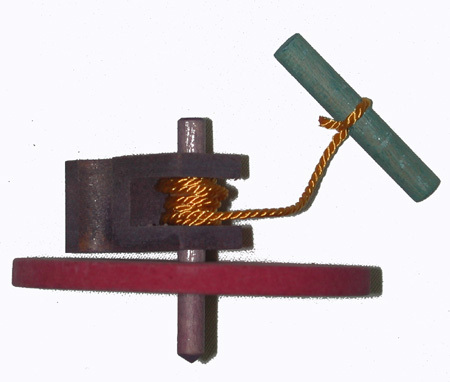 In reverse, there are tricks confined to fixed tip tops, such as regenerative tricks which require friction between the tip and the string to keep the top spinning. 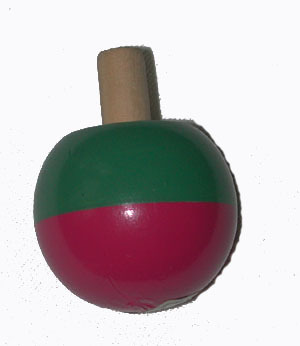 The Double Tip top is another addition to the growing types of spin tops. It was invented by Luis Borge and introduced by YoYo Jam in February of 2000. It features points of spin, bearing or fixed, in both the cap of the top as well as the tip. 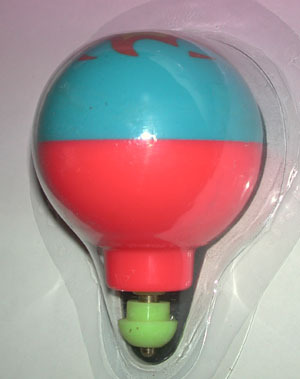 Although not in the universally thought of shape of a top, the buzzer is included in the category because it spins on a major axis, and is used as a toy. It is slightly different in that it is a tethered object, meaning that it is attached by a cord or string. While the origin of the buzzer is hidden somewhere in ancient history, almost every culture has had the toy. Classical Greek paintings often show adult women or young boys playing with it, usually in scenes of the rich or of Olympians. 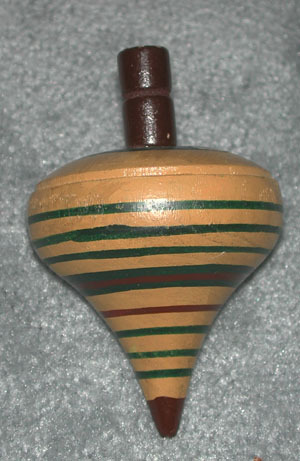 Examples of the buzzer are also found in primitive Africa. Natives of South America called it a �mow-mow." Other names for the buzzer are whizzer, magic wheel and rhombus. It is made from a disc, wheel or plate, through which strands pass through the center. The material of the disc differed in differing cultures. In New Guinea, a shell was used. An Eskimo may have preferred a leather disc, while a child in Europe would most likely to have used a button. Once the disc is revolving, the strings passing through are twisted and untwisted with the alternating pull and relaxation of the tension, causing an interesting visual effect as well as often a pleasant buzzing or humming sound. In most uses, it is a form of independent play. 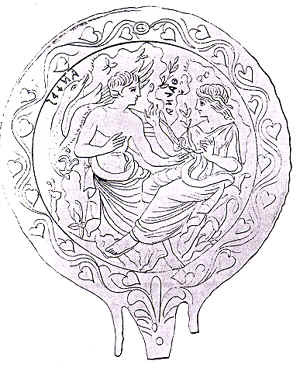 Most amazing is an Etruscan mirror found of bronze with the image of a woman playing with a buzzer. 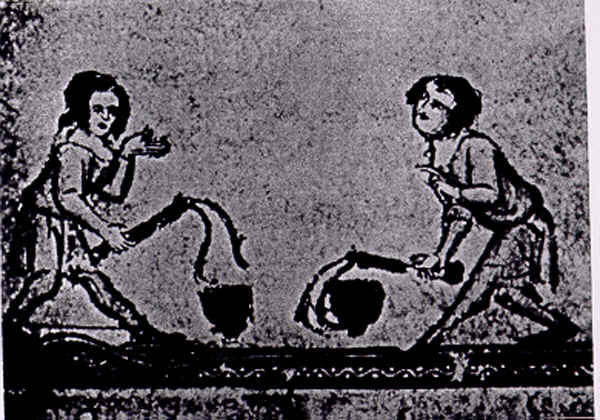 Etruscans were ancient people who lived in the 8th to 1st centuries B.C. in central Italy. Very little remains of their language or culture. See Yo-Yo History for details. 3. Diabolo � a spool which is run on a string between two sticks. Consists of two cones placed end to end with a central shaft. Spun by holding a string attached to two sticks and using friction between the string and shaft by pumping the sticks. Seems to have been originated in China. During the 100�s, missionaries brought the toy back with them from Europe. Eventually made its way to the United States where it was commercially sold in 1907 by Parker Bros.
6. Magic or Silhouette Top � tops which were made in such a shape that they cast a shadow of a face when spun. 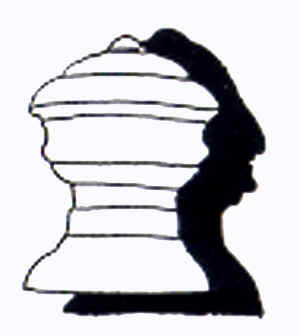 In 1790, a top was made depicting the profile of Marie-Antoinette. In Germany, the �Zauberkreisel,� or magic top, originated using a wire form which when spun appeared as a solid and which create a silhouette of a face. 7. Wizzer � During the 1960�s Matchbox company created this top which had a built-in friction type motor that was activated by sliding the top�s tip along a smooth surface. 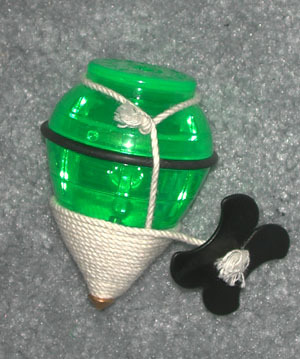 The photo here shows a Wizzer made by the Tyco company. 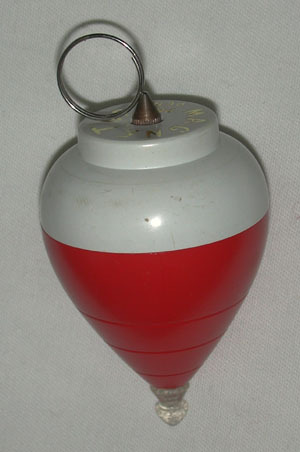 (figure 40) A similar top was also developed by the Duncan company called the Whizzer. 9. Whistler/Humming top � tops with holes in order to produce sound. 11. 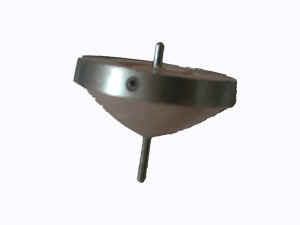 Magnet Top � top with a magnetic peg at the cap. A metal ring could then be placed on the finger, allowing the top to spin while hanging down from the ring. 12. Chain Top � top containing a chain or string attached to the cap of the top, which after thrown, would release the top from the tether. Although logically inspired by nature, all tops appear to result in a use related to pleasure and in some cases, sport. Tops have been used throughout history as a distraction, a pastime, a skill, as votive gifts to honor gods and an item to use in the afterlife. Concurrent development of all forms of tops is the most likely theory, however, to identify strong cultural influences for them in history, one would think of Egypt, Greece and China for the whip top and certainly Japan for the string-powered throwing top. While European travelers impacted their dispersion through Europe and eventually to north America, China and Japan continue to maintain top spinning as true skilled art forms,. 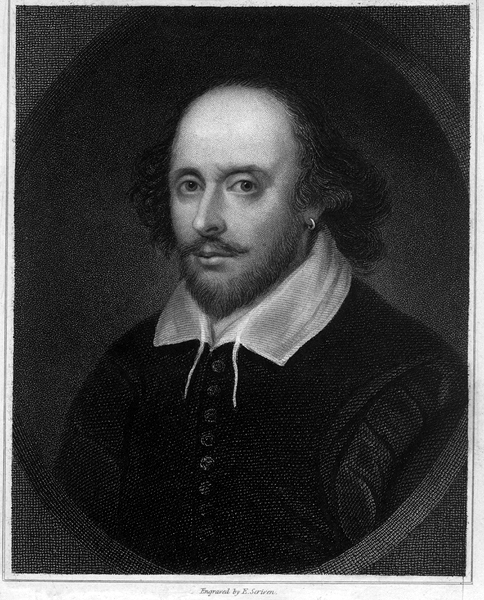 It is most likely that play brought about the tops existence, and play most certainly has secured and maintained its existence. nesting tops. Big support is attached. 31. Photograph from Minneapolis Star and Tribune May 31, 1964 of Valerie Larson, age 8 in spin top contest.